First post, but not a newbie of Amahi. Currently using it for a year now and loving it. I have probably reinstalled Amahi about 20 times to get the it working the way I wanted, as well as a faulty drive that would lock me out upon restart. Other than that, it's been smooth sailing. I have rebuilded my server with 3 new NAS drives and rebuild my Greyhole. I added all the drives, checked and edited FSTAB and mounted shares locally. I forgot to add a share, created it in the dashboard and followed instructions to add the share that I forgot. All showed up perfectly with the right permissions. The share I added was "Software" for my Microsoft downloads and drivers as well as my PC software. After the configuration, I saw eZ Server Monitor display a share called "47%" with some incorrect stats to it. Have anybody came accross this? I have rebooted, stopped services, etc. and it still displays the same. Try restarting mount_shares_locally. That might be the cause. 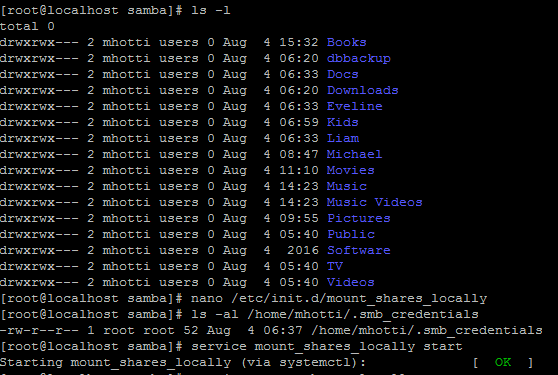 Also ensure there is no share mounted as 47% in /mnt/samba directory. Thanks for the quick reply, Bigfoot. I have tried to restart the service. I have also previously inspected my Samba directory. It's the Music Video share causing the issue. Linux does not like the use of spaces in names. Recommend you change it to Music_Videos or similar. Then restart the service. Brilliant! Done! Thanks for the excellent support. A quick question. I removed the share via the dashboard. Then "ls -l" brings up the old share and the new, but the old share has "root" as the owner. how do I remove it? or should I? Do I do a "rm -rf /mnt/samba/music videos"? Stop the service first, then do the remove as you noted in your post. Restart the service and all should be fine. If this resolved your issue, please mark it as SOLVED. For some odd reason, "rm -rf" does not remove the directory. Anything else I could try? You will probably have to escape the space in your command. Thanks for your patient and great help. It is much appreciated.